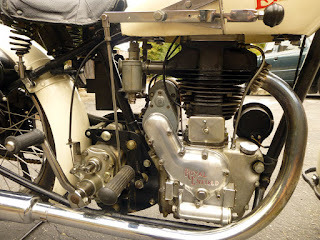 Royal Enfield Model WD/CO was built for World War II. 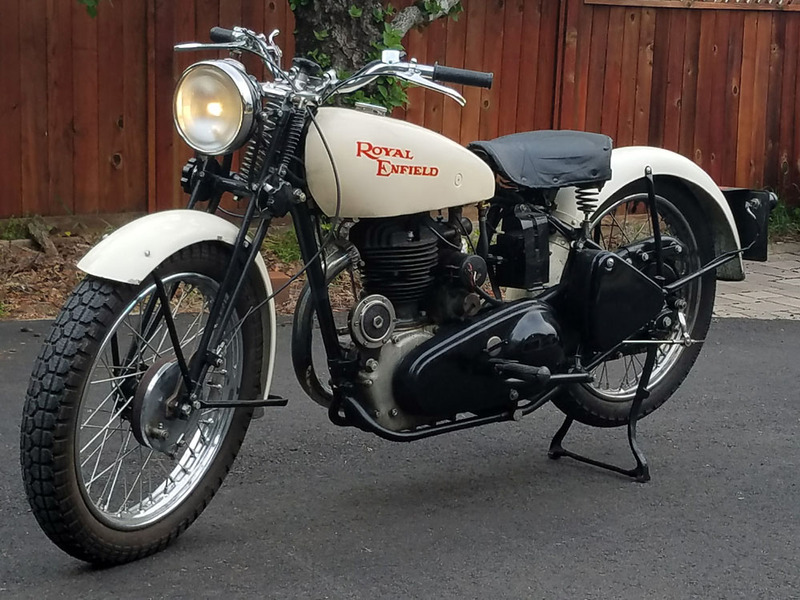 There's a very pretty wartime Royal Enfield WD/CO motorcycle for sale on CraigsList near Santa Cruz, Calif. The ad includes a link to a fun and informative video of a ride along the California coast that illustrates what it's like to pilot this veteran. Is this Royal Enfield an actual war veteran? 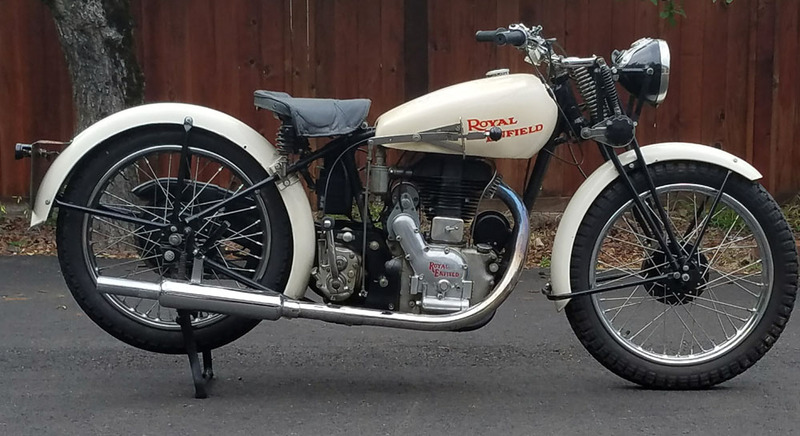 Hard to say, since the post-war Royal Enfield company and others bought back military motorcycles (some probably never used) and "civilianized" them for sale to customers. Clever policy: it not only helped meet pent-up demand for transportation, it eliminated war surplus motorcycles as competition. The seller, Michael, checked the numbers on his machine with Graham Scarth, chairman of the Royal Enfield Owners Club UK. The REOC owns the Redditch factory dispatch ledgers. Now civilianized, old soldier makes a tidy appearance. 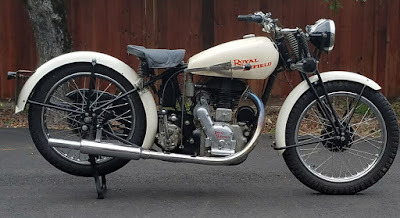 They show that this motorcycle was sent to a War Office depot at Sheffield, West Yorkshire, in October, 1943, as part of a contract for the Royal Air Force. The motorcycle is not listed among those bought back by Royal Enfield after the war, Graham wrote. So someone else civilianized it. The frame and motor numbers match. "Some have noted the front wheel hub is not original and a few have argued about the transmission, though I don't have any definitive info on that," Michael wrote me in an email. "I do have a spare transmission that looks more like most photos of the war bikes..."
"The color origin is unknown. Original, if it was delivered for war use, was likely chalky blue, for RAF (not olive green for the more common Army bikes)." Gearbox is linked to hand-shift mechanism. Whatever the transmission is — it's not the Burman gearbox fitted to some WD/CO motorcycles in place of the more usual Royal Enfield unit — it has an unusual hand-shift mechanism. "Riding with the hand shift is much easier and safer for me since 45 years of muscle memory in left-foot shifting and right-foot braking could be disastrous in a fast-reaction situation," Michael wrote. "The hand shifting presents enough of environment-shift to scramble the muscle memory and cause me, the rider, to think before each action. "The jump from first to second gear is very tall. "The bike is very fun to ride and surprisingly comfortable and well-behaved in the corners. "Here is a video of the bike in its process of restoration to its inaugural ride to Alice's Restaurant." Terrific bike! I'd like to know more about the handshift gearbox. The Roy Bacon RE book makes no mention of it and the photos I have show the handshift mechanism gone by the early 1930s. The gearbox may be an Albion unit. Now is the time to get into all those documents Hitchcock's has to find the story behind that shifter. Again, a very nice machine.